In many German cities, there is a lack of affordable housing. This situation is exacerbated by increased immigration, increasing poverty and high construction and renovation costs. The construction industry is booming! The problem here is that mostly high-priced new buildings are developed. However, one of the biggest problems of the housing market is not solved: A lack of affordable housing in urban areas remains. Especially for low-paid workers, welfare recipients, single parents and students without parental support, this leads to great difficulties in finding a affordable flat on the open-housing market. 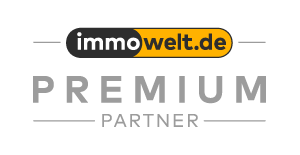 An analysis of the properties on immowelt.de and immonet.de shows that almost half of households in German metropolis touts for around 10% of the freely available apartments. The study shows that the mismatch in Berlin is the highest: According to the city 55% of households would be entitled to a permit for subsidized housing. In the housing market, however, there are hardly any flats in lower price range. Only about 7.3% of the apartments in Berlin are below the appropriate upper limit of rent of the Social Code (SGB). In Hamburg, Cologne and Nuremberg, the situation is similar: the share of households which are entitled to a permit for subsidized housing is at least 40%. Frankfurt, Munich and Stuttgart refused an information on households that were entitled for a subsidized housing. 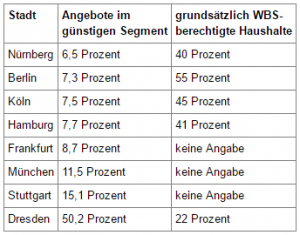 The study also shows that 90% of the advertised apartments for apartment seekers with low incomes are not affordable in Nuremberg, Berlin, Cologne, Hamburg and Frankfurt! The number of people who are drawn to cities, is constantly increasing. Especially, young people are attracted by the prospect of skilled training and work, cultural diversity and lifestyle. The number of people with low incomes continues also to grow. The current Poverty Report of the Joint Welfare Association articulates that a record high of poverty rate is present. The pan-European flow of refugees will further exacerbate this situation. As the third and final point can be metion the unprofitability of the construction of affordable housing. For investors newly built flats are barely profitable with rents below 10 euros. 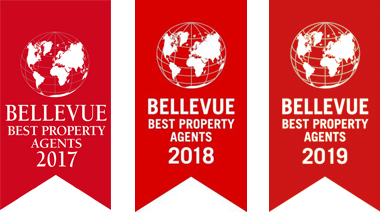 This is due to the rising land and construction costs, more stringent energy efficiency regulations and established the insufficient financial incentives by the residential building subsidies.